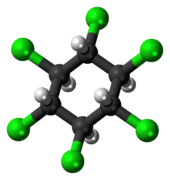 β-hexachlorocyclohexane (β-HCH) is an organochloride which is one of the isomers of hexachlorocyclohexane (HCH). It is a byproduct of the production of the insecticide lindane (γ-HCH). It is typically constitutes 5-14% of technical grade lindane, though it has not been produced or used in the United States for more than 20 years, i.e. since 1985. As of 2009, the Stockholm Convention on Persistent Organic Pollutants classified (α-HCH) and (β-HCH) as Persistent organic pollutants (POPs), due to the chemical's ability to persist in the environment, bioaccumulative, biomagnifying, and long-range transport capacity. This pesticide was widely used during the 1960s and 1970s, particularly on cotton plants. Although banned as a pesticide more than 30 years ago, traces of beta-HCH can still be found in water and soil. Animal studies show that organochlorine pesticides, including beta-HCH, are neurotoxic, cause oxidative stress, and damage the brain's dopaminergic system. Human studies show that exposure to beta-HCH is linked to Parkinson's and Alzheimer's disease. Beta-HCH was present in elevated levels in some patients as recently as 2009. It was manufactured by exhausting chlorination of benzene and for this reason was called erroneously beta-BHC. This synnonym still persists.